Will 2017 be the year of the fold? 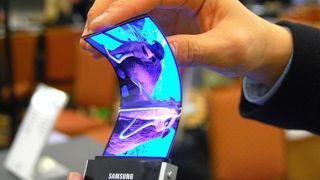 We’ve been hearing about a foldable Samsung phone since at least 2011, but the company might finally be close to launching one. The latest rumors suggest the Samsung Galaxy X (the rumored name attached to Samsung’s folding phone), will be launching in either the third or fourth quarter of 2017 – so the second half of the year. That date comes from a Twitter leaker who only popped up recently, so as they don’t have much of a track record yet it shouldn't be seen as any kind of gospel. But it’s a timeframe that at least somewhat lines up with other rumors. We’ve heard several times that one or more folding phones will arrive from Samsung this year, and as little real information on them has leaked yet a late 2017 launch is probably the soonest we can hope for – though one recent leak has suggested we’ll see a folding phone early this year. If and when the Samsung Galaxy X does arrive it could either have a single flexible screen, or two separate displays with a hinge between them – as both designs are rumored to be in the works. It could also have a 4K screen, based on earlier rumors. Beyond that we know very little about the Galaxy X, but if this latest leak is true then, while the wait is almost over, we wouldn’t expect to see it at CES 2017 or MWC 2017.